Product placement in movies is nothing new. It’s one of the main reasons Back to the Future (and its first sequel) was able to afford its massive budget. It allowed for one of the funniest, most memorable moments in Wayne’s World (“But it’s the taste… of a new…generation”), and it made film history’s most lovable alien synonymous with yellow and orange colored candies. But those are just a few cute examples. The other stuff - the subliminal messages, the in-your-face, down-your-throat gimmicks – are what seem to urk, or perhaps more appropriately, arose suspicion, with self-made documentarian Morgan Spurlock. 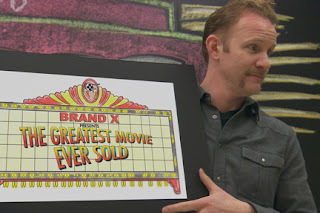 Spurlock, whose work, quite frankly, has been on a loll since his great television show 30 Days, was made to make the greatest movie ever sold. His idea, as they always are, is rather simple: make a movie about product placement in films that is funded solely by sponsors who will have their products placed in his film. So for the first act, Spurlock travels around the country trying to land big name sponsors to feature in, and pay for, his movie. But given the controversy that is often accompanied with his name (the dude didn’t exactly do wonders for McDonald’s) Spurlock finds himself striking out more than he expected. After dozens of cold calls and yeah, we’ll think about its, Spurlock gets lucky with POM Wonderful Pomegranate Juice, who offer him a solid million to be the head sponsor of his film. This explains why the film’s title is preceded by “POM Wonderful Presents” (as opposed to, say, 20th Century Fox Presents), and why Spurlock has been hitting the late night show circuit wearing a Nascar-motivated suit with each of his sponsors blatantly stitched into his blazer. Once the rest of the sponsorship contracts come through, Spurlock has a tough time making each of his clients happy. He can only stay in Hyatt hotels, only pump gas from Sheetz, only drink POM, only fly JetBlue, only drive a Mini Cooper, only eat Amy’s Pizza, and so on. The problem with the film - and I can only see one, although it is rather nagging - is that I’m not exactly sure what Spurlock is trying to say. Is he annoyed with products being so unashamedly placed in our movies or on our TV shows? Does he think it is devaluing entertainment? Does he think the way he funded his movie is a potential way for other movies to secure financing? I’m not sure. But maybe that’s the point. After nearly killing himself via McDonald’s, Spurlock never had a statement to declare. He never once said, “Oh, no, don’t eat fast food.” Instead, he let us decide what to do by watching him act as a guinea pig. At his best (as with Super Size Me, and certain episodes of 30 Days) Spurlock’s lack of message is wholly refreshing. At its worst (seriously, did anyone other than me see Where In the World is Osama bin Laden?) his style is annoyingly vague.